The Hubble Space Telescope is one of our favorite things because it gives us images like the one above, which not only pictures a number of galaxies, but shows the introduction of two new ones. 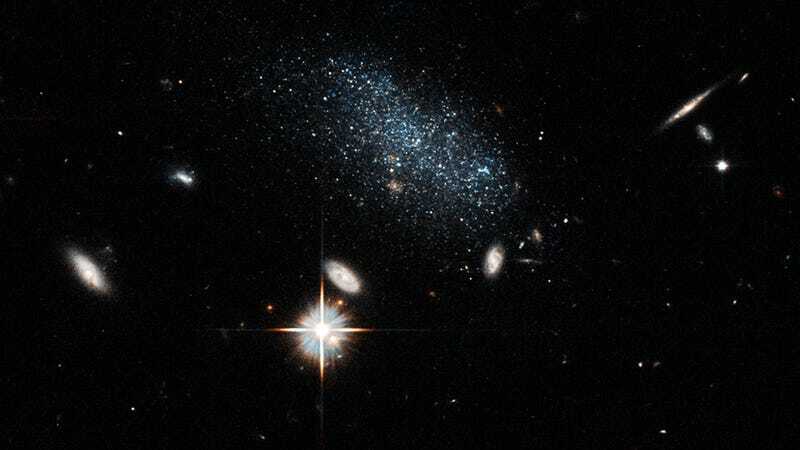 Two tiny dwarf galaxies, called Pisces A and B, have left the area of the universe called the Local Void, which is a region sparsely populated by galaxies, and are joining the rest of the party, according to researchers at Hubble. The theory is that the gravity from the larger cluster pulled them in, which is noteworthy in itself, but scientists are watching over it for any changes, specifically in waiting for them to form stars. Below on the left is Pisces A, which is around 19 million light-years away. On the right is Pisces B, which is around 30 million light-years way. The galaxy-dense region is denser in intergalactic gas, meaning that star birth has a larger chance of being triggered. In this case, the dwarf galaxies seem to have started “a firestorm of star birth,” researchers said, compared to the lack of construction they experienced while in the void. By watching the galaxies, researchers hope to experience star formation first hand. Each galaxy contains around 20 to 30 bright blue stars, signifying that they are both less than 100 million years old. “So they will use up their existing gas. But it’s hard to tell right now exactly when that would happen, so it’s a reasonable guess that the star formation will ramp up at least for a while,” he said.